Rustic comfort and charm! 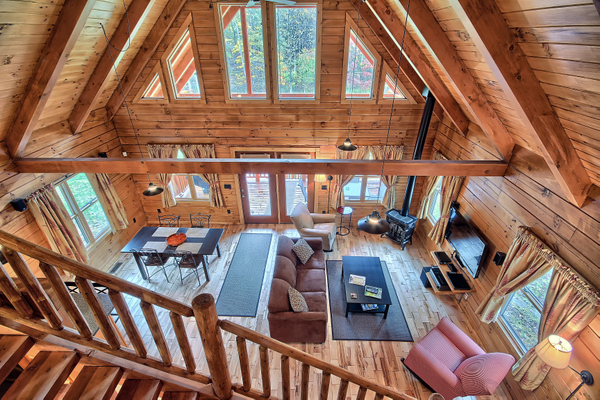 Two private log cabins and a cottage on 34 wooded acres. Choose Pinewood Cabin, perfect for a couple or small family, Amish-built Shadyside, ideal for up to 6 guests, or The Cottage, which accommodates 4 with comfortable charm. All feature cathedral ceilings, cheery gas or electric “woodstoves,” well equipped kitchens, full bathrooms, HDTV and great sound systems, large decks/patio, propane grills, fire rings with free firewood and hot tubs. Pet friendly, of course! At Shadyside and Pinewood log cabins, step down from the main deck to the hot tub deck for a soothing soak. At The Cottage, the hot tub is just a few steps from the back door. Our cabins and cottage are well separated by both distance and trees, yet booking all three would create the perfect space for a small family reunion when you want to be close but have your own private space. Note that the Pinewood Cabin has a large shelter house. All three have plenty of room for tents and small campers. Call us to see if we can accommodate your group. 10,000 acres of forests, gorges, cliffs and caves await you in the Hocking Hills. Marsh Hollow is close to all of the major attractions: Rock House, Conkles Hollow, Old Man’s Cave, Cedar Falls, Ash Cave…and more!